It is 13 March 2016 and time for the fourth episode of The Night Manager. Former hotel night manager Jonathan Pine (Tom Hiddleston) is now deeply enmeshed in the secret arms trade Richard Roper (Hugh Laurie). As Pine gets closer to securing evidence of Roper's crimes, his mission is imperilled by a romantic advance from Roper's girlfriend Jed (Elizabeth Debicki), the growing suspicions of Corky (Tom Hollander), and his London-based handler Angela Burr (Olivia Colman) attempting to pull him out of the fire. The slightly unconvincing insertion of Pine into Roper's life is complete, and that frees the second half of The Night Manager to arc up the stakes and suspense as it approaches its climax. Pine now has two main causes for worry: the fear he will be caught out spying on Roper, and the fear he is going to get caught out sleeping with his girlfriend. The second one feels a bit of a cliche to me, but it is admittedly very well performed by Hiddleston and Debicki and does lead to the episode's most outstanding scene. Poor Corky: manipulated out of Roper's inner circle, treated with callous disregard by a man he considered a friend, and supplanted by a smooth-talking new partner that he simply does not trust. It would be easy for him to explode, and rage, and make all kinds of accusations. At a public lunch, however, he gets hopelessly drunk, starts a toast, skirts the closest of lines towards outing Pine and Jed's affair, and then simply cannot bring himself to do it. Instead he engages in a violent racist tirade at a waiter, staggers about, even tries to enter a fist fight, all because he simply cannot upset his master. 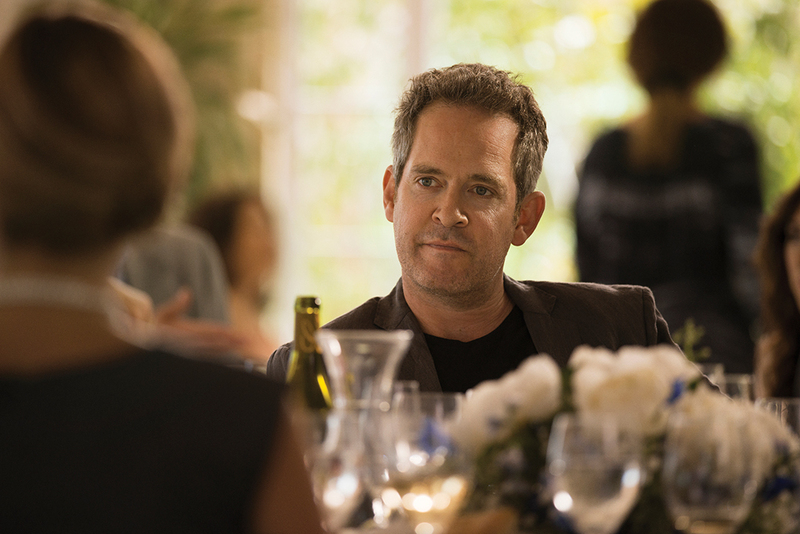 Tom Hollander plays it brilliantly, showcasing enormous inner conflict among a mess of emotions. What is worse for Corky, Pine comes out of the public display looking even more reliable and useful to Roper. I think it is testament to Hollander's performance that, despite Corky's grotesque bigotry and strong penchant for homosexual harassment, one winds up feeling terribly sorry for him. One feels less sorry for the Spanish lawyer Apostol (Antonio de la Torre), who is found naked in bed with a lover - both of their throats cut. He was introduced living in obscene wealth, so ignorant of his teenage daughter's feelings that she committed suicide during her own lavish birthday party. While he clearly showed regret, he never showed enough to engage the audience's sympathy. The death of his anonymous girlfriend - naked, sexualised, and soaked in blood - did not escape me. Once again The Night Manager showcases the hideous treatment of women in this world of espionage. Back in London, Angela is racing to identify two of Roper's anonymous partners within government circles. To help her she drags in reluctant mid-level MI6 manager Harry Palfrey (Neil Morrissey), who confirms Roper's allies are much closer than she expected. It is classic Le Carre storytelling: small conversations between middle managers, and far removed from the luxurious Bond-like environs in which Pine continues his work. It is also a rather lovely surprise to see Neil Morrissey, seemingly type-cast for life as the hapless Tony in Men Behaving Badly. playing such a downbeat dramatic role. At the same time it is hardly a surprise that MI6's Geoffrey Dromgoole (Tobias Menzies) is involved: he's looked like a villain since his first appearance. This is a much stronger and more engaging episode that the last, and successfully kicks the series well into high gear. It also ends on the strongest point so far: Angela wants Pine out, he disobeys her orders and heads to a weapons deal in Istanbul: no allies left, and no way out. This is great television.